If you are looking for a Peace Sign for a craft project, but you don't know what Cricut cartridge, if any, contains a cut for this image. MyCutSearch.com will show you the Cricut cartridges that contain a Peace Sign or the word Peace along with a preview of the Cricut cartridge page that the image appears on. You can then scroll through all of the previews, and click on the images to enlarge them, so that you can easily find the one that is perfect for your crafting project. Hint: In most cases, use the singular version of a word instead of the plural to get more results. For example search flower versus flowers to get more results. For more great search tips click on Search Tips or Videos under the Information menu. MyCutSearch.com will save you time when working on your scrapbooking, card making or paper crafts. You will no longer have to flip through all of your Cricut handbooks or cheat sheets to find the perfect image to complete your crafting project. Just type it into the search box and we will show you all of the choices you have. Use our Share Button to tell all of your scrapbooking friends about us also. 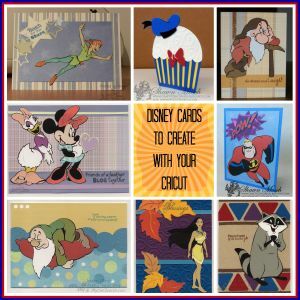 Here is a collection of Disney cards that you can create with your Cricut, using some of the papers and stamp sets you might already have. Click on the image for project details.